Since I persist in using Microsoft Windows as my base system, I’m used to not being able to do the kind of nifty tricks that other people do with Emacs and shell stuff. So I was delighted to find that the literate devops that Howard Abrams described – running shell scripts embedded in an Org Mode file on a remote server – actually worked with Plink. Here’s my context: The Toronto Public Library publishes a list of new books on the 15th of every month. I’ve written a small Perl script that parses the list for a specified category and displays the Dewey decimal code, title, and item ID. I also have another script (Ruby on Rails, part of quantifiedawesome.com) that lets me request multiple items by pasting in text containing the item IDs. Tying these two together, I can take the output of the library new releases script, delete the lines I’m not interested in, and feed those lines to my library request script. That’s in a task that’s scheduled to repeat monthly, for even more convenience, and I also have a link there to my web-based interface for bulk-requesting files. But really, now that I’ve got it in Emacs, I should add a #+NAME: above the #+RESULTS: and have Org Mode take care of requesting those books itself. On a related note, I’d given up on being able to easily use TRAMP from Emacs on Windows before, because Cygwin SSH was complaining about a non-interactive terminal. As it turns out, setting the following made it work for me. # Do I already have it checked out or on hold? Skip. Here are my notes from Damian Conway’s talk “Fun With Dead Languages”. =) I heard him give an older version of this talk years ago, and I’m amused to find that my Latin dabbling gave me a much deeper appreciation of this talk. As always, click on the image to view a larger version, which you can print out if you want. 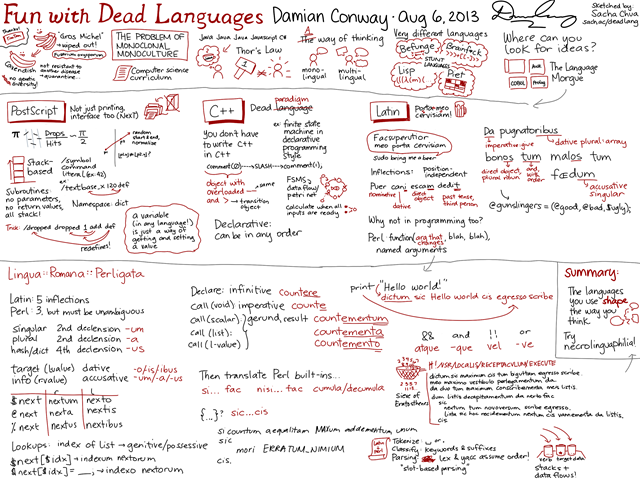 If you like this, check out Damian Conway’s site or this paper on Lingua::Latina::Perligata. Like these sketches? Check out my other sketchnotes and visual book reviews.